Lisa Forkish opened her eyes as the members of Vocal Rush, an Oakland high school a cappella group, sang the last dissonant chord of a song called “Colors,” which is about dealing with racial issues in the United States. The students were standing in a circle facing one another with their eyes closed. Forkish, the group’s founder and director, wanted them to listen closely to the music without visual distractions; she wanted them to feel its emotional impact. Their voices resonated throughout the sun-filled room, a haunting and unsettling sound. Founded in 2011 at the Oakland School of the Arts, the group is made up of high school students at the charter school. They have won the International Championship of High School A Cappella (ICHSA) three times, including this year in April. In 2013, they placed third on NBC’s The Sing-Off, a televised a cappella competition between some of the best musical ensembles in the country. With the level of success they’ve garnered, the group has decided to use their art as a form of activism: “aca-activism,” that is. At the end of their ICHSA set this year, after performing a cover of Sara Bareilles’ “Brave”—a piece about finding the courage to speak your mind—the singers turned around to reveal the words “#BLACKLIVESMATTER” spelled out on the back of their outfits. Three of the singers stood at the front of the stage with their hands raised, a nod to “Hands up, don’t shoot,” a slogan and gesture affiliated with protests sparked by the fatal shooting of Michael Brown, an 18-year-old African American, by Darren Wilson, a white police officer. The incident took place in Ferguson, Missouri in August, 2014. Sarah Isen, a 16 year old in the group, said that the first time they performed the song was in front of a mostly African American crowd. That was the moment she realized their music was more than just entertainment. “We were all just crying on stage. That was a really profound moment for me.” said Isen. Forkish allows the students to express their feelings about the racial climate in the U.S. not only through performing, but also through songwriting. As an accomplished songwriter and arranger, Forkish helps her students assemble pieces that they feel convey their messages. The group also hopes to represent Oakland in a positive way. 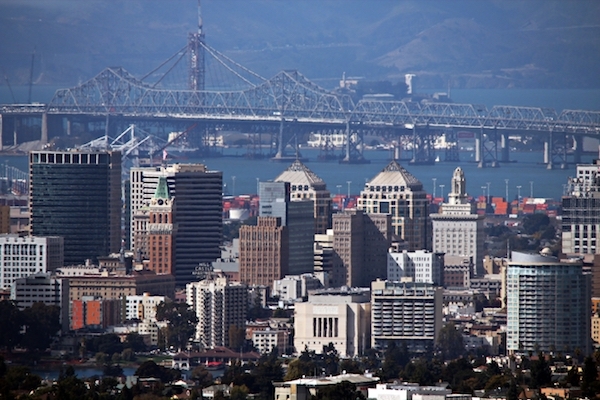 “In the news and the media, Oakland is seen as a bad place. Just to have a group of young people performing almost every single weekend, doing big things, shines a light on Oakland,” said William Southall, a 17-year-old veteran of Vocal Rush. Vocal Rush’s next performance will be at Oakland School for the Arts School of Vocal Music Presents: “Light & Gold” on December 12 at 7 p.m at First Congregational Church.